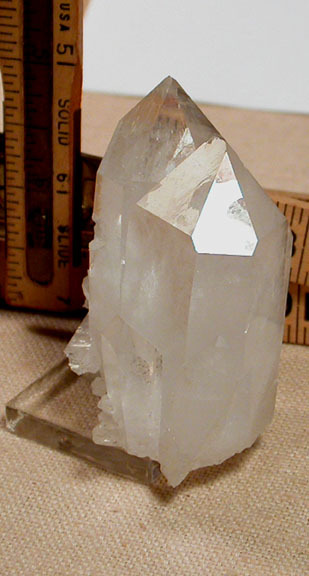 This Isis faced twins' rock crystal cluster has a self-healed base as well as a growth crater partway up the left most prism side which is also healing. These twins have light titanium shading to their faces, each has a small tip chip, one has a small uncommon 7h face, each has devic veils and is much more clear than the photos show. 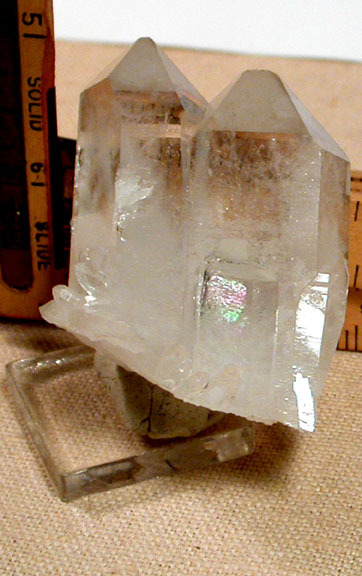 Tabular rider crystals have rainbows and little penetrators add light and dimension. Overall measurements are 1-1/4x 2x 2-1/4" tall, a miniature with large amounts of record keepers.